Our Eidfjord cruise port guide gives you information about the docking location, cruise dock, transportation options and much more! 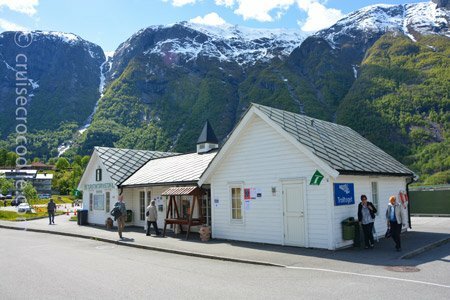 Welcome to the Eidfjord cruise port guide. Eidfjord is a little town in the western part of Norway. It has a population of almost a 1000 people that are depending on the income of tourism, hydro-electric power and fishing. It is situated in a unique environment in the middle of the Norwegian fjords. It is the perfect place for hikes or to get yourself on a bus to visit the Hardangervidda National Park. Your ship will have to leave open sea and sail into the famous fjords of Western Norway. The ship will sail into the Hardangerfjord for a couple of hours. This fjord is the 4th longest fjord in the world and 2nd longest fjord in Norway. After a couple of hours your ship will go into the Eidfjord, which is a branch of the Hardangerfjord. From here it only takes approximalty 1,5 hour to arrive in Eidfjord town. Make sure not to miss this part of the journey. One you have arrived you will notice you are in the middle of the famous fjord area and that time moves at different speeds in serene places like this. Eidfjord is very small, so you could imagine that there are limited things to do in town. We definitly recommend to leave town and go explore Norway nature at its best. The reason that ships go to Eidfjord is not because of the town itself, but because they want to give you that fjord experience and because it is the gateway to the Hardangervidda National Park, the largest national park of Norway famous for its Alpine climate mountain plateau. 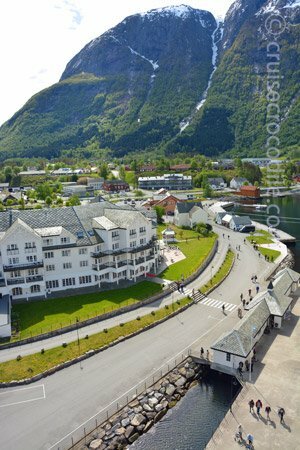 Find out underneath what it is you want to do in this Cruise Port Guide Eidfjord – Norway. This is the view from the ship. When you arrive in Eidfjord you are going to be in the most serene place on earth. As you can also see it is very small, therefore staying in town will not be worth it. This is the tourist information bureau that is just outside the gates of the dock. Here you can arrange all kind of tours, buy your souvenirs or get any information you would like. There is one spot where cruise ships can dock. This spot is where you walk straight into town. In town you will find an art shops, some souvenir shops and restaurants. The tourist information you’ll find right outside the pier area. This where you can buy excursions, arrange taxis, buy souvenirs, post postcards and get maps. Use their facility because they are one of the best in Norway. There is a bus stop in Eidfjord, but local transportation in Eidfjord is so limited that we couldn’t recommend to take in anywhere as getting back will be the problem. There is a handful of taxis available through the tourist information point. Be quick or prebook them to ensure you have one. Keep in mind that taxis are not cheap in Norway. Expect to pay about 700 NOK per hour. At the tourist information there will be several tours offered. These tours are offered without guide and are operated with mini bus. For +/- 40 euro they take you to the Voringsfossen. Keep in mind it sells out fast. There is a small trolley train that gives guided tours through the town of Edifjord. This is clearly not the most exciting thing to do in Eidfjord although many people seem to like it. It goes about every hour. Check their schedule and buy your ticket at the tourist information. This is also where it departs. Rent a mountain bike or tandem bike at the tourist information. Price: between 150 and 400 NOK for half a day. Rent a kayak at the tourist information for +/- 150 NOK for the first hour and +/-40 NOK every additional hours. There are about 3 hikes that start in the town of Eidfjord. All 3 are between 1 and 2 hours long. For people wanting to do something active or within a budget, this is actually a really nice thing to do. Pick up the map with routes at the tourist information. For more information and inspiration click here for the Hardanger digital brochure. This informative centre is the place to visit before going to the Hardangervidda National Park. It tells you all about its geology and zoology. It also has an amazing video of the Hardangervidda National Park . This spectacular video shows you just how vast and boundless this national park is. Visit this centre first before going to the National Park to get a better understanding. The area is full of waterfalls. The most famous one is the Vøringsfossen. It is a 182 meter tall, with a free fall of 145 meter. See the large quantities of water splash into the valley. This is one of Norway’s largest stone-filled dams. It is one of the main scenic and architectural attractions of the area. The sysen dam is the main water reservoir for Sima Power Station. See how it collect its water from glacier meltwater and rain water. Learn about the system that lays over the entire area to create hydro electric power for 300.000 people in Southern Norway. Visit this tiny shop for all kind of wood products. Jewel boxes in birch, cupboards, tables, benches, wood carvings and a collection of fiddles. The collection here is exquisite. From port it is 900 meter walk to the south. You’ll find this church in the town of Eidfjord. It is a white, stone church that was build around 1309. It serves as the main church for centuries until 1981. Check if it is open and enjoy the beautiful 1700’s interior and the graceful graveyard surrounding the church. Guided tours by appointment. Arrange through the tourist information. From port it is 900 meter walk to the south. Cruise ships dock directly in front of the small town of Eidfjord. Find tourist information, wi-fi, bank facilities and souvenir shops close by. 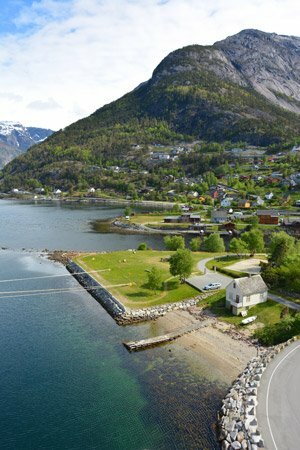 Read about all the facilities of the Eidfjord cruise port in the full cruise port guide. When your ship is going to their port of call you eventually need to leave open sea and sail onto the fjords. Your ship will need to sail on the Hardangerfjord for about 6 hours before it arrives in port. This is a spectacular sail in. The closer to the end you get, the more scenic it will be come. Make sure to be on the outside deck 1,5 hour before arrival and visa versa. There are about 3 hiking routes that start right at the port. They each last between 1 and 2 hours. 1 even goes past a hundreds of vikings graves. Don’t get to excited though, it’s just a pile of rocks. Ask the tourist information for their map with suggestion walking routes.